To hear Karen Dalton sing "How Sweet It Is" or "When a Man Loves a Woman" is to hear the song completely transformed. The Oklahoma-bred, New York City-based singer sustains what were previously just grace notes, moves the accents around, inverts the rhythms, and plays hide-and-seek with meter. Dalton even changes the lyrics at the end of "When a Man Loves a Woman", fitting them to her female perspective. Her talent isn't merely interpretive, but imperialistic: She takes these songs over completely, bending their melodies and meanings to fit her specific mood. And In My Own Time, her second and final album, has a very specific mood: These songs exalt love, but acknowledge its transitory nature. 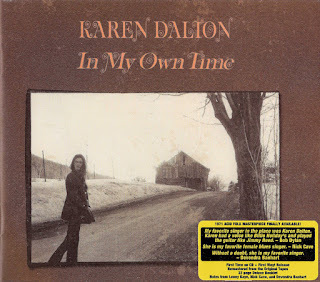 Dalton gives herself over to its joys on "How Sweet It Is", notes its passing on her majestic take on Richard Manuel's "In a Station", then sounds resigned on closer "Are You Leaving for the Country?" The album contains just the slightest hint of a narrative-- a struggle between love and loss, the city and the country, joy and sorrow-- but she sounds honestly conflicted, a jaded romantic trying to find her way. So that phrase "in my own time" fairly neatly sums up her life. She arrived in New York City with her daughter Abra in the early 1960s and became a fixture on the budding East Village folk scene-- even sharing the stage with Bob Dylan. But Dalton moved around compulsively, played rarely and begrudgingly, drank and did drugs heavily, and recorded almost never. She enjoyed playing privately with friends and hated the Billie Holliday comparison that dogged her throughout her entire life. Producer Nick Venet reportedly had to trick her into recording songs for her first album, It's So Hard to Tell Who's Going to Love You Best, released in 1969 and reissued by Koch in 1997, four years after her death. 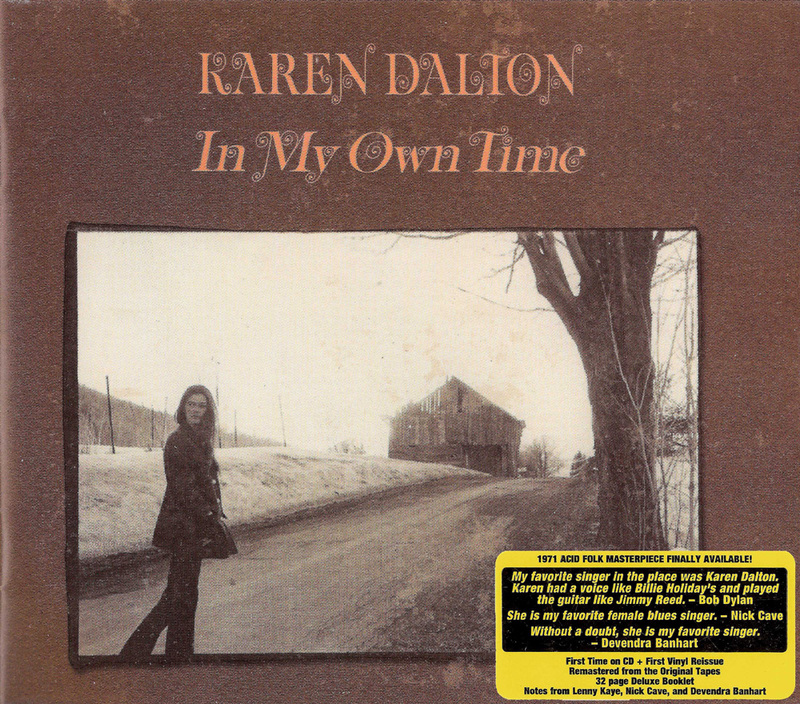 Dalton casts a subtle but powerful spell as she sings songs by Tim Hardin, Fred Neil, and Duke Ellington with minimal accompaniment. In My Own Time was released in 1971 on producer Harvey Brooks' Just Sunshine label and has since been a collector's treasure on vinyl. Admirers Nick Cave and Devendra Banhart (who is turning folkie resurrection into a cottage industry) extol her talents in the liner notes for this affectionate reissue. Compared to It's So Hard to Tell Who's Going to Love You Best, In My Own Time sounds a little more adventurous and lively with its full band and free-wheeling performances, seamlessly and playfully blending folk, country, rock, jazz, and soul. More than a dozen musicians coalesce into a loose, loopy backing band that knows exactly when to push forward ("In a Station"), exactly when to back off ("Take Me"), and exactly when to let Dalton take front and center (pretty much always). In My Own Time has the laidback, lackadaisical vibe of a close-knit group of friends doing single takes around an inspired singer. They play up the jazzy breeziness of "Take Me" and "Satisfied" and soak "In a Station" with multiple organs and Richard Bell's rambling piano, giving the song a majestic push ideally showcasing Dalton's dramatic range. They tackle the tripping rhythms of "How Sweet It Is" as Dalton sings almost independent of the familiar melody. With such a clear dynamic between all these musicians, it's ironic that two of the album's most moving tracks are also its most naked: the bleakly existential "Katie Cruel" and the supremely lonely-sounding "Same Old Man" showcase her elastic vocals and piercing banjo with only minimal accompaniment. You could easily spill a thousand words on her pronunciation of "mackintosh." Like her debut, In My Own Time reveals a demanding, intuitive, eccentric singer and arranger who never sang her own words but clearly and confidently expressed herself with others'. She was a free spirit who sounds freest on these ten tracks. So "Are You Leaving for the Country? ", with its swooning melody and laidback vibe, closes the album on a poignant note: this is her final take, her last number ever. It makes you wish there was just one more record to reissue and even more music to pore over obsessively.